Earlier this week, our colleagues at the WBZ/UMass-Amherst poll reported that the New Hampshire Senate race was now too close to call. The Cook Political Report also moved the race to the Toss Up, as in candidate stomach churning, column. Through our regular measurements of both campaigns’ Facebook metrics, we have been tracking the ups and downs of the Shaheen-Brown contest since primary night in early September. What light does our Facebook Forecasting Model shed on the race? As we reported at hashtagdemocracy, where we are tracking 15 different Senate races, the Shaheen-Brown contest has been steadily tightening since the first of October. Our Model’s two-week averages show Brown’s support growing from a low of 42.6% on October 1 to 50.3% on October 15th. Brown’s 50.3% total on October 15th represents the high water mark for his candidacy since we began tracking this race. But, in the gut-wrenching world of campaign time, October 15th was years ago. The latest forecast from our model, based on data gathered from Facebook on October 22nd, indicates that Brown’s growth has halted and Shaheen has regained her footing. Our forecast now shows Shaheen leading Brown 51.1% to 48.9%. As the WBZ/Umass poll reported, the race for the New Hampshire Senate is very close. But, according to our tracking of Facebook social media metrics since the poll was fielded, the momentum appears to have shifted back – slightly -- to Senator Shaheen. The Scott Brown candidacy in New Hampshire presents an interesting outlier challenge to our Facebook Forecasting Model. In fact, there is no other candidate in the history of Senate campaigns quite like Brown. Why? Early this week, we used Scott Brown’s surging Facebook PTAT to predict that Brown would walk away with the Republican nomination for Senate in New Hampshire. With the primary behind us, we can now apply our full Facebook Forecasting Model to the Senator Jeanne Shaheen/Brown contest. The model produces a weekly two-candidate election forecast. Over time, the weekly prediction also provides a dynamic track of which way a race is moving. Our forecast for New Hampshire predicts that Senator Shaheen is on track to hold her seat with 56% of the vote. Can publicly-available data from the Facebook pages of candidates for U.S. Senate in New Hampshire tell us anything about who will win come Election Day next Tuesday and in November? If what we learned during the 2012 elections is any guide, the answer may be a whole lot. In 2012, we found that Facebook “likes” and “PTAT” metrics, when added to a model including standard forecasting fundamentals, can produce surprisingly accurate vote forecasts of campaigns for the U.S. Senate. The question remains, however, whether our results in 2012 were an anomaly or a tool to expand the statistical forecasting of election results to campaigns for Congress. In Alaska, Joe Miller’s surging growth in fan engagement on Facebook demonstrates the power of the impeachment issue with Republican base voters. It also underscores what we have found since we began tracking campaign Facebook metrics in 2012: Facebook provides an important window into measuring the effectiveness of campaigns in striking responsive chords with voters and engaging them. 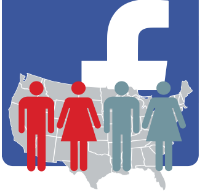 What can Facebook candidate likes and page engagement metrics tell us about the likely outcome of 2014 Senate races? If the 2012 results and the 2013 New Jersey Senate campaign are any guide, the answer is a whole lot. The Year of the Jilted Tweep? Twitter can be a powerful tool for Congressional candidates but they can't leave their followers to lie fallow. If campaigns were won and lost by the number of Facebook fans a candidate recruits, Senator Scott Brown would have defeated Elizabeth Warren on Tuesday: 370,536 fans to 316,312. But instead Warren pulled out a narrow victory at the polls.